Although built cultural heritage contributes to the structure, grain and character of our cities, it is rarely considered in emergency planning. Yet the loss of built cultural heritage following disaster is often greatly mourned by local communities. Focusing on The Rocks heritage precinct, this presentation will outline the process of disaster risk management planning for places of cultural heritage significance. It will examine vulnerabilities and risks to the built fabric and heritage values, and discuss mitigation, preparation, response and recovery strategies to minimise risks and losses to cultural heritage from disaster. 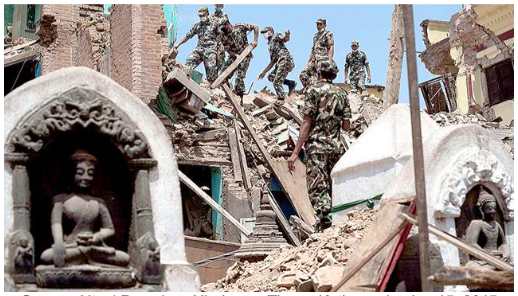 The Gorkha Earthquake of April 2015 caused extensive damage across areas of Nepal, extending from the mountain villages of Gorkha, through the World Heritage sites of the Kathmandu Valley to the base camp of Everest. The impact of the quake has been immense and rebuilding will take many years. This presentation will look at the input of heritage professionals and others to the recovery and reconstruction process – through damage assessment, provision of training, providing culturally appropriate solutions to reconstruction issues, and promoting the use of local materials, knowledge and skills. Catherine Forbes is an architect and Built Heritage Specialist with GML Heritage, a member of the Australian Institute of Architects and an expert member of ICOMOS-ICORP (International Committee on Risk Preparedness). Catherine has been involved in post disaster recovery through Emergency Architects Australia and undertook the UNESCO International Training Course in Disaster Risk Management of Cultural Heritage at Ritsumeikan University, Kyoto, in 2014. She is currently involved in the Rebuilding Nepal network and village reconstruction with Healthabitat. RSVP: by Monday 19 October 2015 to Mary Knaggs via email.